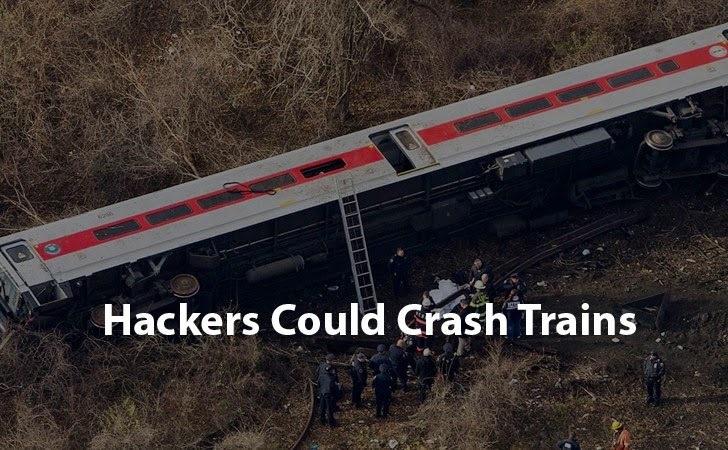 After reaching heights in cyber attacks by targeting SCADA systems, hackers are looking forward to crash trains. It isn't only assumptions; it could actually happen in real. A new hi-tech railway signalling system being tested in the United Kingdom could potentially be hacked by cyber criminals to cause oncoming trains to crash into one another at highest speeds, an Internet security expert has warned. ...actually lack in security that could easily expose the systems to malware and allows malicious actors (like terrorists) to cause massacre around the UK. Internet security expert Professor David Stupple told the BBC that plans to replace old railway signal lights with new digital systems could expose the railway network to cyber attack, causing a "nasty accident" to happen involving terrorists as they could "easily expose the new mainframe." "It's the clever malware that actually alters the way the train will respond," Stupple said. "So, it will perhaps tell the system the train is slowing down, when [it is] speeding up." However, Stupple acknowledged that the Government are not complacent because they are completely aware of the dangers of the dangerous impacts and "they are worried about it." The Internet security expert at City University also outlined that the operators and the government ministers are working on more safer and better security measures in order to avoid the upcoming cyber threat. What could be the worse part? Stubble also highlighted the government's fears that the possible and the biggest threat of hacking could come from an insider. Yes, we talking about the Insider Threat. In most of the cases, the security systems are very well protected against the outside malicious hackers and cyber attacks, but the real danger could come from an insider rogue employee. "The weakness is getting malware into the system by employees," the expert explained. "Either because they are dissatisfied or being bribed or coerced." Network Rail, the in charge of the new train line upgrade that is expected to be completely operational by the 2020s, confirmed it has acknowledged the threat. This means the new upgradation to the train lines could be at risk of a security breach. "We know that the risk (of a cyber attack) will increase as we continue to roll out [the] digital technology across the network," a spokesman for National Rail told the BBC. The spokesperson added that Network Rail will work closely with the government, the security operators, their partners and suppliers in the railway industry as well as the external cyber-security specialists to better understand the potential threat to the new systems.